The majority of fathers in Canada (74% in 2006) cared for their children in a married or common-law family. Another 14% of fathers brought their children into a stepfamily or were stepfathers to a non-biological child or children. Fewer were lone-parents (8%) and only 4% of fathers indicated no children living in their household. The concept of fatherhood has broadened considerably in the last 20 years. Today, fathers include men who have children in common law-relationships, gay fathers with or without partners, divorced or separated men who do not live with their children, stepfathers or men who have become stepfathers, adoptive fathers, foster fathers, fathers in blended families and older men who no longer live with their grown children1. Given the realities of Canadian fatherhood, it is difficult to measure how many of these different types of fathers we have in Canada. 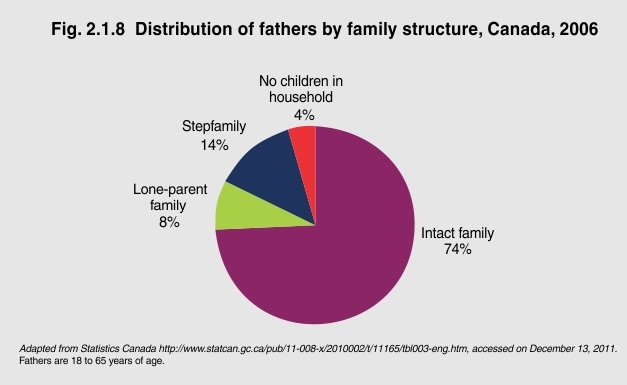 1Father Involvement Research Alliance, Canadian Fathers by the Numbers accessed at http://www.fira.ca/article.php?id=66 on December 13, 2011.